• how to deduct season tickets? • how to deduct golf? parties, and events? • How to write off your vacation home? 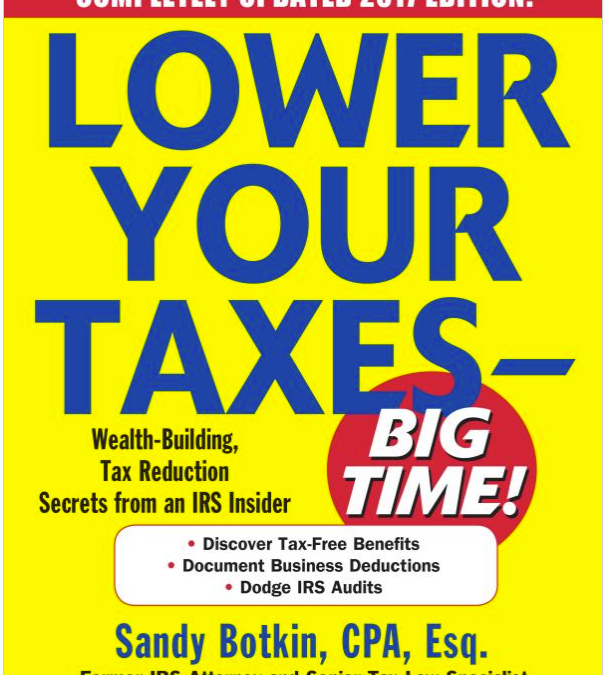 This is my favorite book for business owners because it teaches you the sandbox in which many juicy tax deductions can become authentic and bona-fide, all from an ex-IRS agent’s expertise. If you’re looking for ways to write off vacations, trips, vacation homes, vehicles, retirement plans, and other big ticket items, this book does a magnificent job of providing clear communication, with precision and accuracy to the IRS law. Sandy Botkin’s story is pretty interesting, as he is a former IRS agent. As most government bureaucracies, he found out that there’s an opportunity in helping people navigate the very code which he enforced – transforming him into an author, consultant, and speaker. This is a handy book to read – even if you’re a client of Nuance Financial, because it shows you the exact sandbox in which you must operate – and the documentation necessary – to take advantage of tax law concerning opaque write-offs. The bottom line is that this is a great $10 kindle read, or a $15 handbook to go through. Even as CPA’s, it’s hard for us to communicate as clearly as this book, so we’d almost rather people just spend the $10 to have the book on their iPhone.